One purpose of this site is to proudly recall the valor and sacrifices of the hundreds of young men who bravely and nobly answered the call of their country - to honor both their spirit and their courage. Other purposes include reuniting old buddies, sharing memories you had to be there to understand, and to just having some fun. Below is our version of a site map, which highlights the contents of the buttons shown on the top of each page. We have compiled a list of over 400 known members of A/1/6, most from the years 1967- 69. Additional information will be added as it becomes available. Our pages are dedicated to a great group of brothers who actively share information, provide support, and make wonderful friends. Please share your stories with buddies, family and friends. We are just starting to build the Scrapbook section of the site. If you have items to share please go to our Contact page. 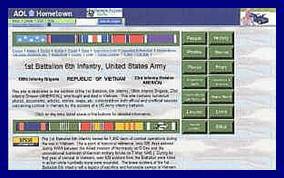 This is the page for stories, military operations, and items of interest. In many cases we will link you to other sites, so use your back-arrow button to get back to our site. You know that box of “Vietnam stuff” you have packed away? Bring it to life! Share photos, documents, and more with old friends. We have over three thousand items in our collection. Please help it grow! Please click on the Contact button for help on sending photos & slides. Here is a new photo sent in by Jim Love, 1st Platoon Leader. 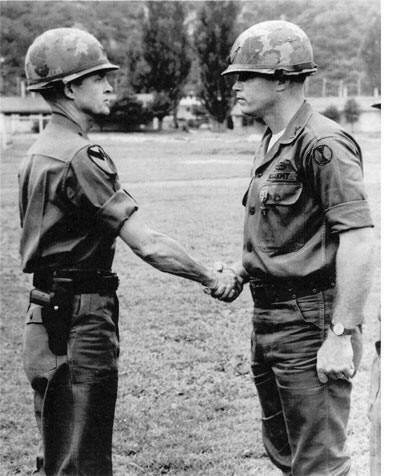 He was receiving a Bronze Star Medal with "V" device for valor from then Major General Harold (Hal) G. Moore, author of "We Were Soldiers Once...and Young." The award was presented to Jim at the 7th Infantry Division HQ at Camp Hovey, Korea in April of 1970, two years after the nighttime attack on Company A in the Que Son Valley on 29 April 1968. We had not found Jim's award at the National Archives because we have only searched the records for 1967 and 1968. 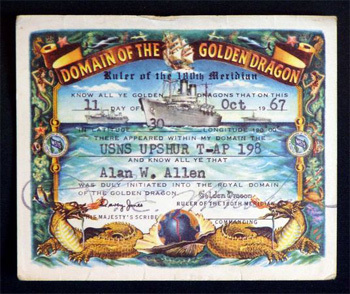 The Americal Division published this award in 1970. We did find Jim's Purple Heart for that action, which was published just 2 weeks after the event. Jim also received a second Purple Heart resulting from an attack on LZ Center on 9 May 1968. We never found that award in the Americal Division records because it was published in July of 1968 at Fort Campbell, Kentucky, where Jim was recovering in the Medical Holding Detachment. Reunions are a lot of fun and we have hundreds of photos from them on our photo site. 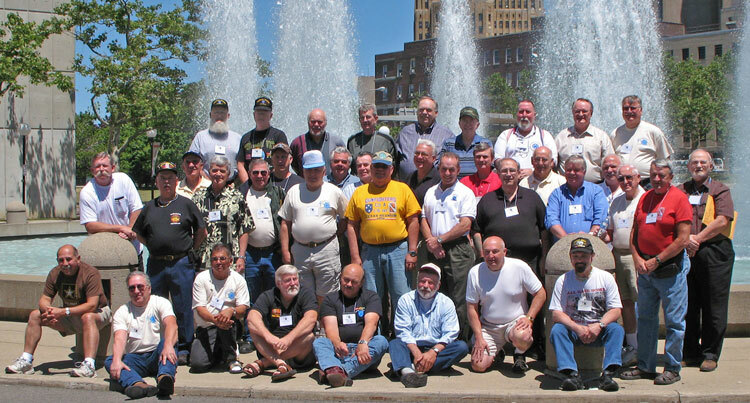 They include photos like the one taken below at the 2007 Americal Division Veterans Association (ADVA) reunion in Buffalo, NY with other members of the 1/6th Infantry. 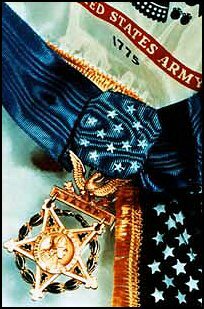 The men of Company A, 1st Battalion, 6th Infantry salute Medal of Honor recipient Platoon Sergeant Finnis D. McCleery and all the gallant men known as the Gunfighters. In this area we list and display all of the awards and decorations we were able to locate at the National Archives for those personnel assigned or attached to elements of the 1st Battalion, 6th Infantry. The work done on this project is in memory of Sergeant Joseph H. Picarelli (Pic), KIA 15 May 1968. The links to all of the awards will be completed over the next few months. On this page we will recommend links to some useful and/or interesting web sites. Click here to see the visits made in the last 12 months.